I'm finally taking the plunge and putting a loop of track around the lobby of my office. 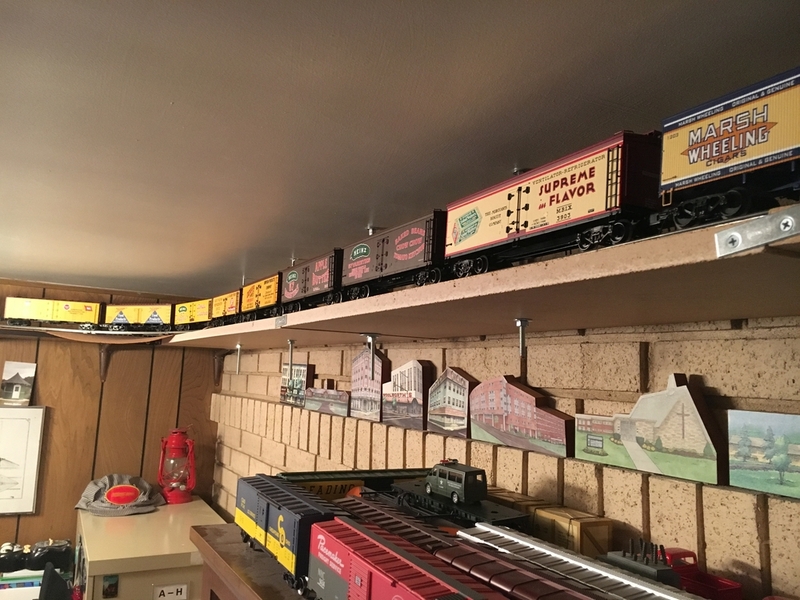 After 4.5 years of owning the place I've decided to go w/a bit of a railroad theme, as the railroad ties marking off the front beds outside still had tie plates & spikes in them. That's my story, and I'm sticking to it. However, it also provides other benefits, such as: 1.) 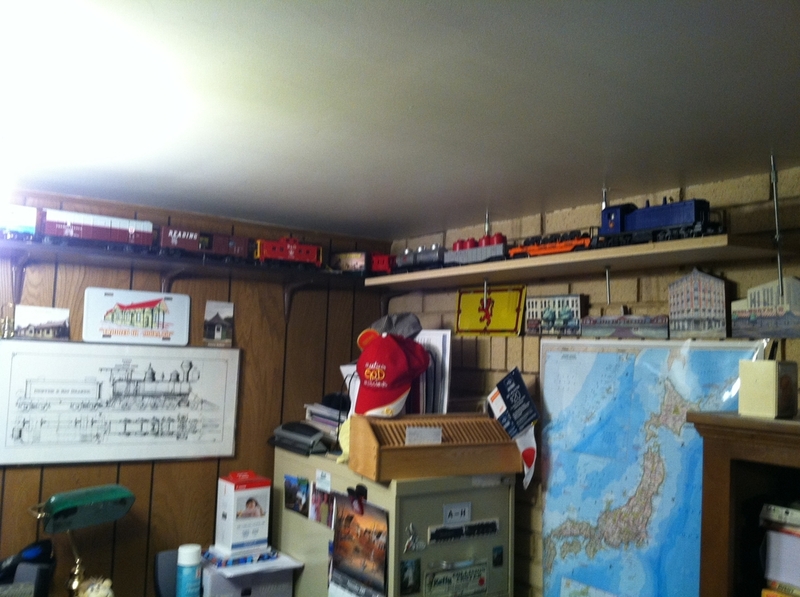 Giving me a place to run my trains before I can get around to building a home layout, 2.) Giving my wife less train stuff at home to see/deal with/hear about, etc., and 3.) My hobby becomes, in part, a business expense. 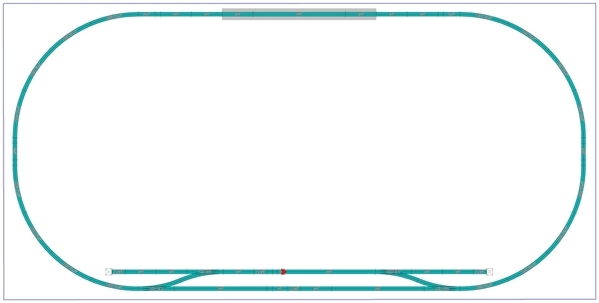 The area is exactly 8' x 16' and I've ordered a loop of ScaleTrax with O80 curves and 4 lock-ons. I've always wanted to try ScaleTrax and figured this would be a good way to test it out. 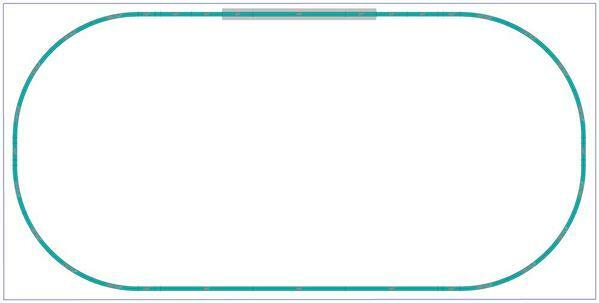 I wanted a solid rail for noise issues, and plan on using Flexxbed underneath for additional sound suppression. I plan on using either 0.75" Plywood or 0.75" MDF for the shelf itself. 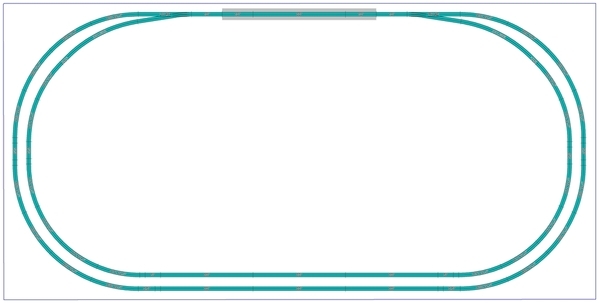 I'll be using the MTH Arch Bridge w/holiday lights (40-1115) and two extensions (40-1116) to span the gap over the Dutch door. Expecting it from Pat's Trains on or about Tuesday. I also wanted to try MTH's new DCS WiFi, as I would like to eventually add this system to the LEGACY that I have at home. The hassle of keeping track of a remote control at the office is also something I can do without. I ordered the MTH DCS WiFi bundle Mr. Muffin's Trains is advertising, and should arrive about the same time. A Lionel power brick should provide the juice - I don't have any conventional engines, nor do I plan to get any. I will likely be using metal "L" brackets into the studs with the wall mounts above the shelf & track, with the shelf sitting on top of the horizontal leg. I may need to mount a few above the board to clear the window trim (can notch the boards for a tighter fit, but can't alter the bracket). I've seen in at least one thread (I can never seem to remember/find the same old thread(s) again after I read them) where I believe someone used 3" brackets top-mounted on MDF, but the security of that hold would worry me, I think, especially if not gluing in addition to screwing the shelf on. The bigger construction concern that I have are the two 46" gaps between the side walls and the back wall (see crude diagram of the room below). Is either board rigid enough to span the gap without significant flexing? I was planning on leaving the corners on the board for additional support (I was going to just cut a "U" out of an 8x4 sheet and mount the entire thing in each corner, with 6-8" wide planks connecting the two). 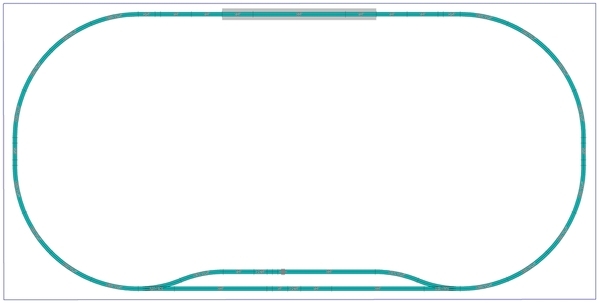 rather than make a curved cut on the outside to follow the track. 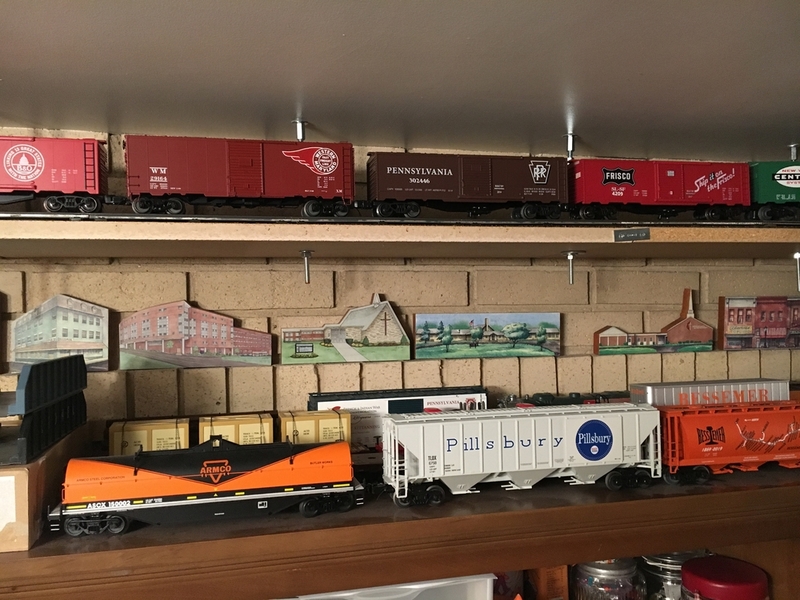 I would love to hear any feedback tips, & tricks those of you that have built shelf layouts have, especially w/respect to ScaleTrax, mounting brackets, shelf material, and the aforementioned gap concern. 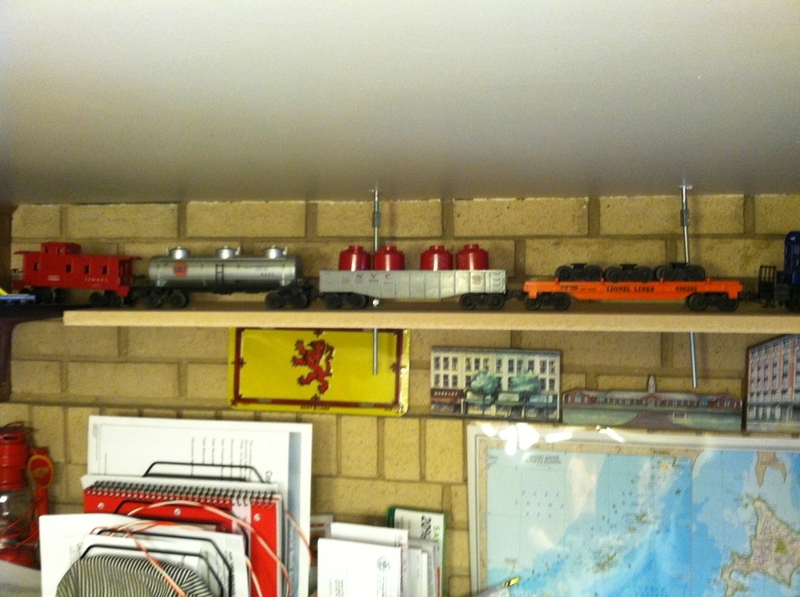 I'll also keep searching through old shelf layout threads. Thanks! 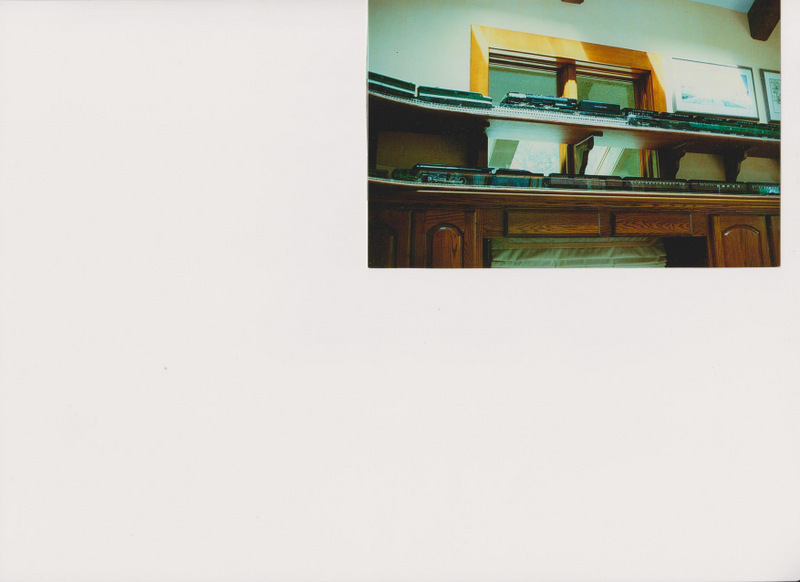 I have a shelf layout, but your photos say "image not found". I will check back later. I am embarking on an office shelf layout as well. Good luck and pictures still not showing up. I think I got the pictures fixed ok. Sorry about that. 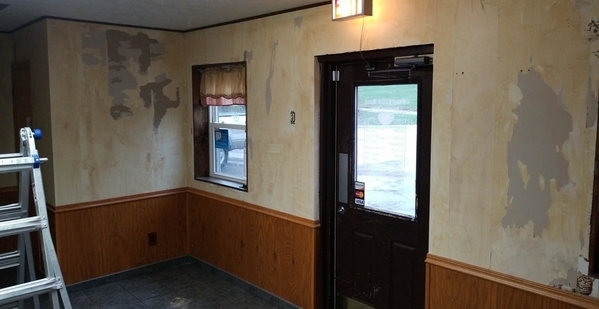 Progress has begun on re-doing the lobby in preparation for the layout. I have reviewed multiple topics on these forums concerning shelf layouts, and was wondering if anyone had any new preferences or thoughts for MDF vs. Plywood. From what I've read there can be more distortion over time w/plywood, but better screw security over MDF. This would be in an air conditioned & heated lobby; moisture & humidity haven't been major issues in the past. Comments would, as always, be appreciated. 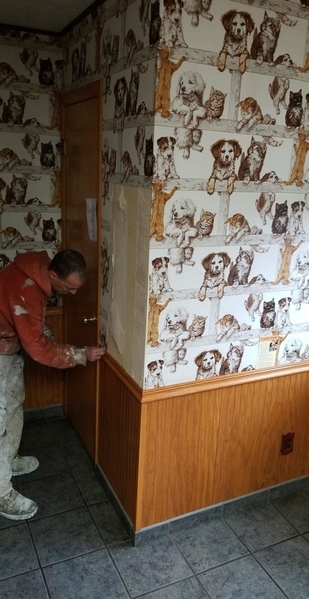 I'm trading services with a client and we were able to get the wallpaper down a couple weeks ago. A minor roof vent leak we discovered has been fixed. Today we've started mudding & will repair a patch of drywall that we partially removed with the 40 year-old wallpaper. It'll be at least 2 coats of mud, plus touch-up, before we can paint. Going to use a light grey ("Gravity")_ for the walls and a dark grey ("Crucible") to go over the dark brown trim (crown molding, door, windows). The grey should make for a nice autumn/winter sky backdrop. While trains will be running year-round there will definitely be a special focus on Halloween (have MTH train on order) & Christmas (should have full scale PE train as well as CP Christmas train for this year). 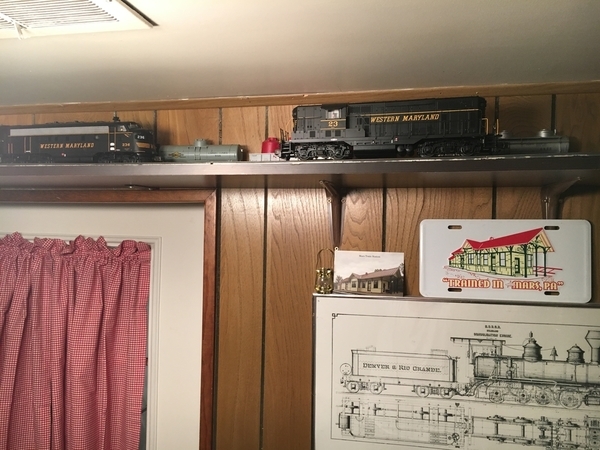 I should have about a foot between the ceiling and top of the board for scenery and plan on using foam board and several MTH buildings with Christmas lights to scenic a small passenger station area, as well as residential, and commercial areas in the corners of the layout. That's all for now. Hopefully these pictures load ok - they look fine on both my computer & cell phone. Will post again when there's progress. The room is looking really good! I used MDF for my Ceiling Central RR, and it has worked out okay. I agree on the statement that it has less chance of warping, but doesn't take screws as well as plywood. Since mine is in a basement family room, I used precut and finished shelving. A foot clearance should work nicely. I only have 7 inches because of the low ceiling and it makes it harder to see what I'm doing, and leaves less room for scenery, which I only have made a minimal effort to date. John - I would definitely do that at home (if I ever get around to that layout...) but I'm not sure if I'll do too much scenicing re: background, as it is still an office lobby. 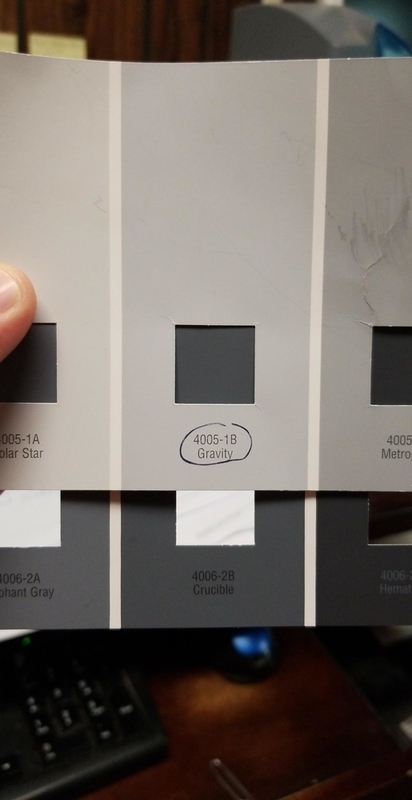 I'm hoping the grey paint serves as a somewhat effective October-December Midwestern sky. Not sure if I'll paint the shelf itself white or dk. grey yet. 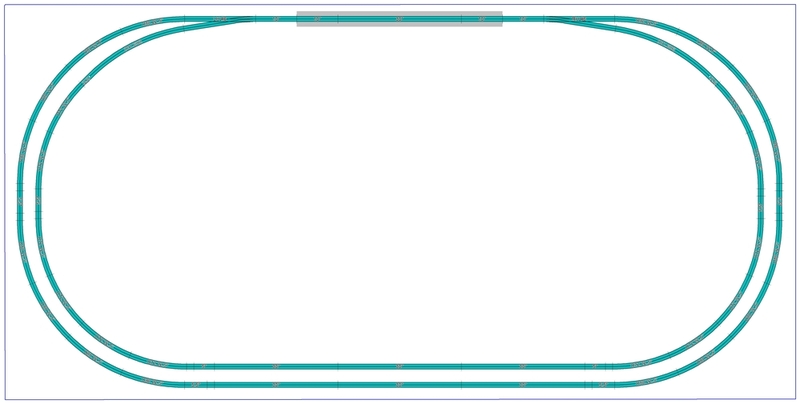 I may eventually ballast the inside edge of the track, though at over 6.5' high most low things won't be visible. I plan to do some small hills & elevations of foam as sands for buildings & scenery given the time. Probably several, spanning multiple seasons - one in snow, one green & lush, & for autumn. Would be good use of the corners of the 4'x8' boards at the end, which I'll be preserving for structural integrity. Would love to be able to get the paint up by the end of the week. I'll keep y'all posted! For mine I used baltic birch plywood for the bed and dimensional birch for the brackets. The tubular track is glued to Woodland Scenics foam under layment which is glued to the birch. I used the birch because it gives you a nice clean edge for a nice poly finish. 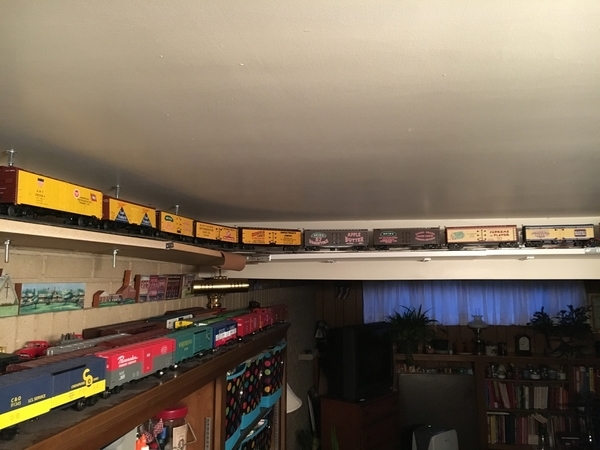 If I were to do it again the only real change woud be to make the shelf all the way to the wall to give you the ability to do some scenery, whether it just be some back drops or backdrops and building facades. Ceiling brackets where it passes in front of the closet doors. Doug - Very nice! Thank you! Have you noticed any issues w/the wood warping, etc.? I'm probably leaning that route vs. MDF right now. Also, the drywall is patched & 1st coat of mud complete. Just have to find a time to do 2nd coat & sand, then painting can begin. Won't get done this weekend, though, with my stepson's graduation and holiday. No problem at all with any warping, the Baltic Birch plywood is extremely stable, after cutting and some fine sanding the polyurethane gives it a furniture grade finish. If the price has risen like that common plywood be prepared for sticker shock, this was done some years back before most building materials went nuts. I will make one very strong recommendation, based on a lesson learned with this project. 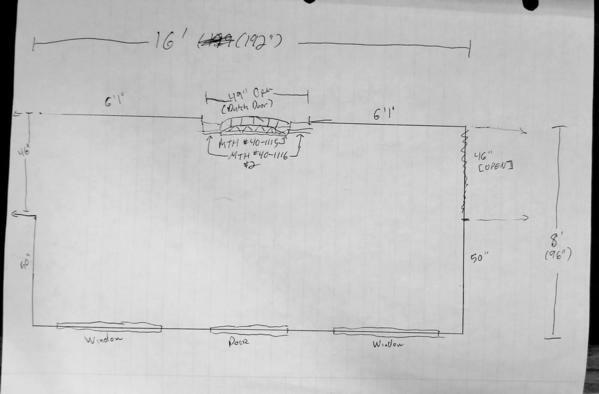 Before cutting and doing your sub-assembly for final installation not only do you need your dimensions to be accurate but also check your dimensions from opposite corners. This is a step I didn't think about but learned when I started installation. The "cookie-cutter construction" of homes tends to leave rooms that don't have square corners. Was a real pain going up-n-down that step ladder to make minor adjustments so everything fit properly. BTW, fastening the wall brackets firmly is paramount. Fastening the sub roadbed (birch ply) to the wall brackets is next most important. However, fastening the track to the roadbed is, IMHO, a matter of keeping the track from shifting side-to-side.....because gravity does a pretty good job of keeping things 'down'. IOW, don't fret too much about a lot of thread power in keeping the track in place. ...used mainly in the hanging of suspended ceiling rails/panels are a very handy, inexpensive, quick way of providing support for a safety wire....for which I use a very thin steel cable, such as included in picture hanging kits but certainly available in bulk, cut-to-length at larger hardware, home improvement stores. Oh yes, another lesson from the School of Hard Knocks....keep your train controls out of reach of curious customers. There's 'hidden', and there's 'locked'. One client found that 'hidden' doesn't mean much to determined Easter egg hunters and masters of playscapes ....or bigger kids who never were smacked for inappropriate curiosity! Thank you all for the advice! I will definitely look for birch plywood & try to avoid soft. KD, I do like the safety wire idea - more subtle than a couple inches of Lexan screwed to the edge. Surprised only 1/2" is enough, but will do! I think I'm leaning towards painting the wood that dark grey to match the rest of the trim. Any suggestions for wall-mounted supports? I was thinking I might craft those out of plywood, too, especially if I can't find prefab wood ones and for areas where a longer support is needed. The main walls of the lobby have been mudded, sanded, primed, and painted! Hoping to get trim pieces, sills, and door done soon. After that I can work on the shelving! Thanks for your interest and input; I'll keep you posted! The room is looking great Neal!! While I normally prefer stained wood for the natural beauty, I think the paint will help blend in so the train will stand out more. Started painting the dark trim last weekend. After that the painter just needs touch-ups & to do the bathrooms, then we can get to building the shelf! Neal, I used dimensional birch for the support brackets. The vertical pieces are 1x2 with the horizontal pieces being 1x3 or 1x4 depending on how long they need to be for proper support. They are assembled using screws and dowels as well as a really good quality carpenters glue.They are all attached to wall studs except for the ones in front of the ceiling height closet doors which are attached to the ceiling joists. I do not trust dry wall hangars for anything that will possibly have to support the weight of an articulted steam engine or possibly some die cast hoppers, etc. Doug - Thanks! I will definitely consider that for the supports if I go with the wood look. I agree w/respect to drywall hangers. Even if I did use metal brackets everything would be screwed into the studs. It's been a busy summer & I apologize for the lack of an update. 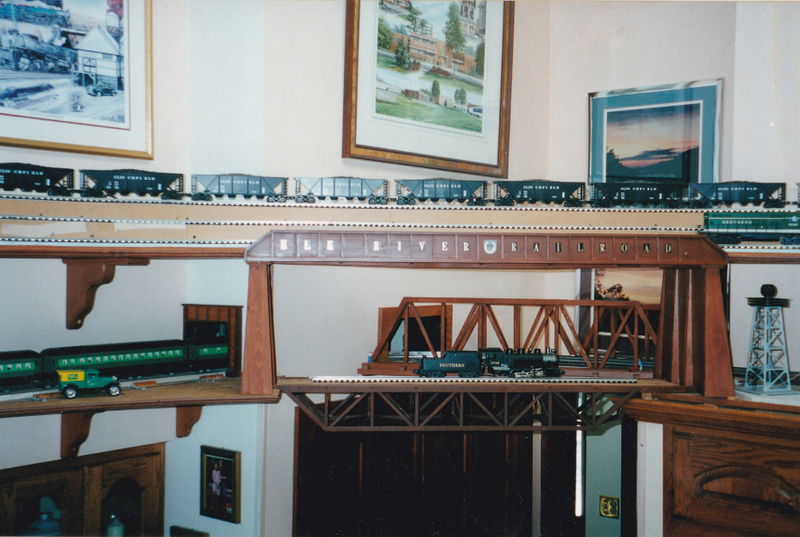 The lobby is basically done (save the door) and my father & I will get to work on the layout in the coming weeks (once they get back from vacation). 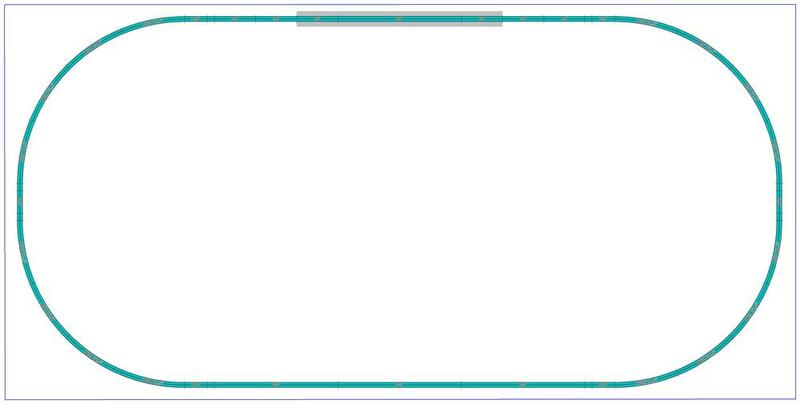 In the meantime I couldn't help but toy with the layout & added a super-long siding. This would allow me to park a train while running another. I believe I've got 4.5" center rail to center rail at minimum. 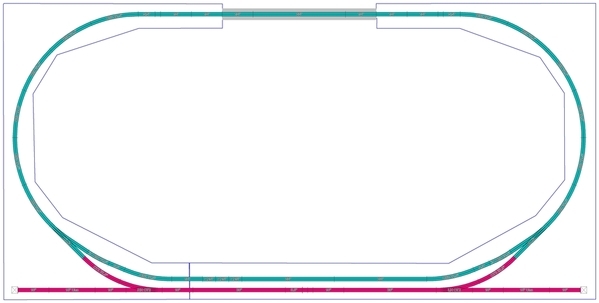 It would require 1 foot shelving on the front side of the layout vs. 8", though. A neat idea, or should I leave well-enough alone? I think the siding is a good idea. You have to get a 1' piece of cardboard or something and place it up on wall and decide if you think that it extends outward too much. being able to alternate trains will save on maintenance and wear and provide an option to avoid boredom. heck, you could even time them to alternate. I would make the route of the active train on the room side for a single. Here's a thought that makes folks shudder for some reason. In a thread discussion of a shelf layout upside down supports were proposed. Many went ballistic thinking it would fall. The member that proposed the idea, then, provided photos of his work. The bracket wall leg was virtually invisible above the shelf because of the viewing angle. Doing it this way, he was able to install crown molding under the shelf for a very nice finished look. 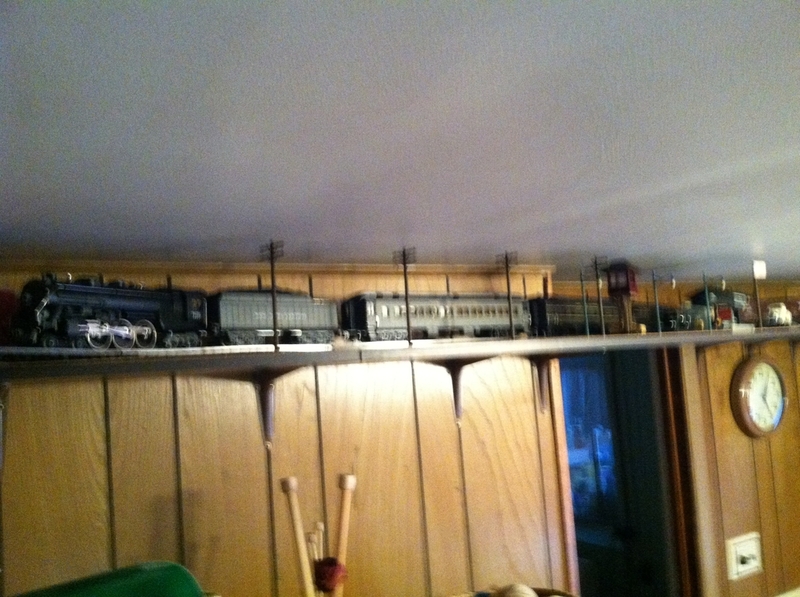 But remember now your running train will be on the inside and harder to see unless you make the outer loop the siding. 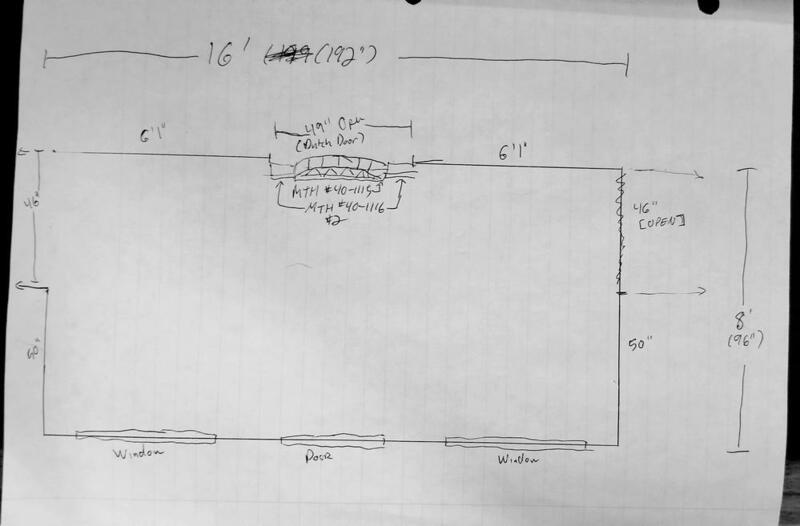 To me if your going to do a siding the whole length, why don't just do two loops and put one about 4" higher ( the one closest to the wall ) and then you could run two different trains at one time. From your 6/11/18 post - here is a sagulator to calculate the load bearing capacity of a shelf. They only offer fir for a material choice, but, birch is stronger and has more plys and better glue. When I did mine I used 1" x 12" x 8' Boards. Still had to add at corner for curves but it worked well and I used O54 track. Here are some photographs of my shelves. 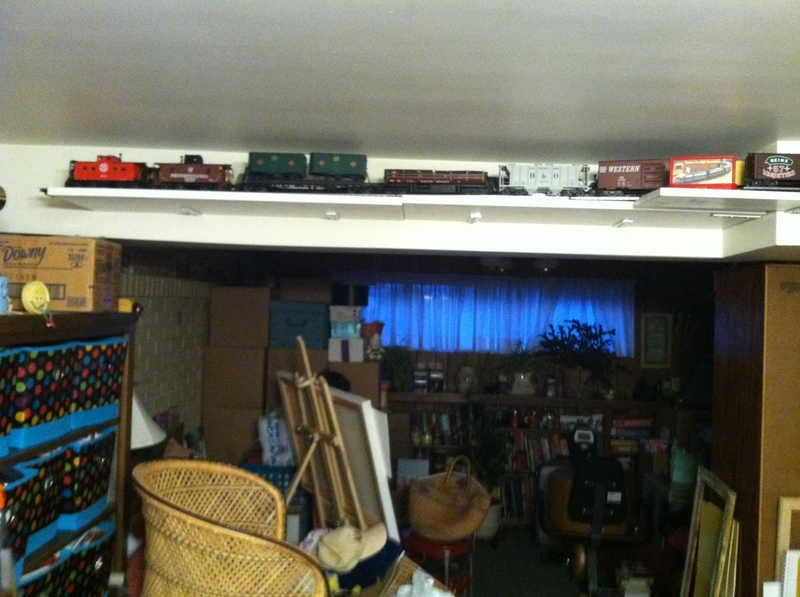 They are in a basement family room, where the ceiling is split with the bulkhead for the load bearing I beam and ducts. The trouble is, there are jogs on two adjacent walls. 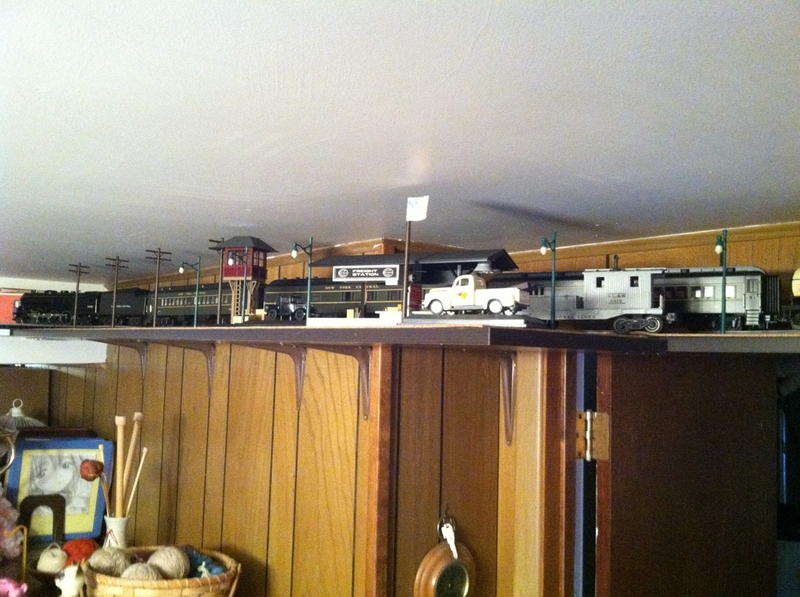 With 12" wide shelves, I can run 2 separate loops, with 2 trains running. 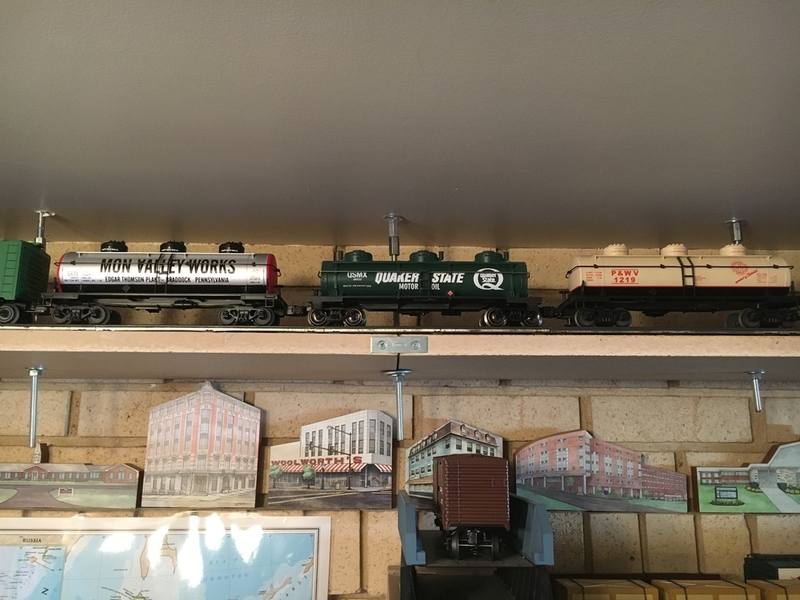 I am fine with my engines that need only 042 and 40-foot boxcars, but I run in trouble with my 60-foot passenger cars. The overhang, just barely clips cars going the other way on the jogs. 042 inside loop, and 054 outside loop. I have shelf brackets underneath, screwed into studs on the 2 paneled walls, brackets from above on the bulkhead, and anchors in the joists coupled to all-thread on the brick wall. I never dressed it all up because no one really sees it but me and my wife. That's a pretty neat link, Carl!!! 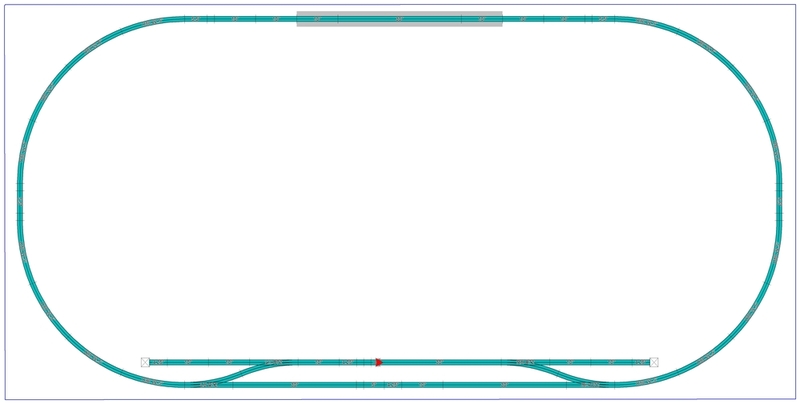 Here's another alternative I may consider, though only good for shorter trains (only 50" of straight siding). 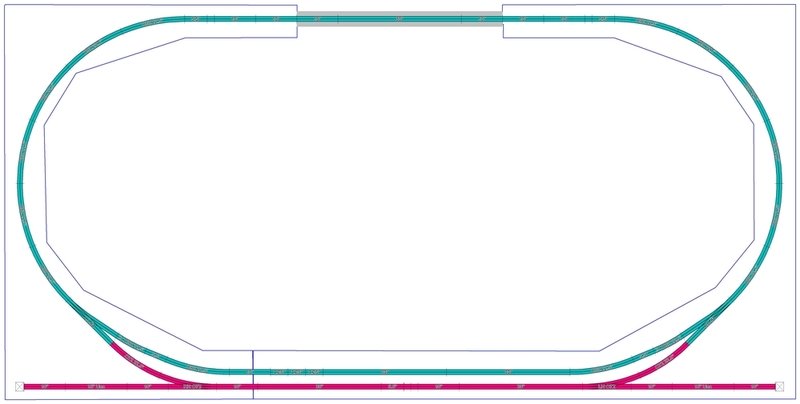 I'm worried that a double track will be just overkill for an office lobby, though this could be a compromise plan. The "bridge" over the front desk space has been purchased & is sg. track so I'm locked into that. I'm thinking about just mounting the whole thing to a sg. 8' board & foregoing the pylons (would have to re-mount electronics for Xmas lights). to maintain structural rigidity. 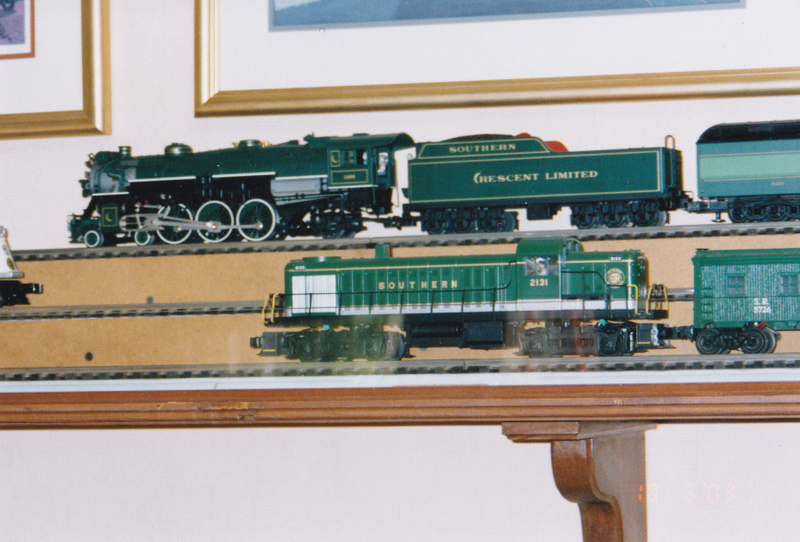 I'm a fan of late steam & scale passenger cars, so weight is very much a factor for me. A big thanks to all who have posted in reply of late. Summer's been a bit crazy at the clinic but hoping to start actual layout construction in a couple of weeks. I will keep you posted! Hey Dewey those are the same shelf brackets i used on my old shelf layout. Lowe's sold them to me for like .80 ea as a contractors bundle. They were very sturdy once you got them tight up against the wall. Hey Dewey, hope all is well. Your NCDOT F59PHI, is it the City of Salisbury or City of Asheville? 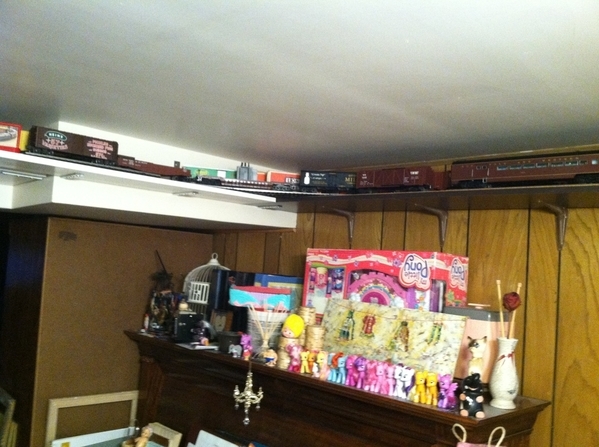 Put your siding closest to the wall so you don't hide the train that is running. Salisbury Ron. I'm still kicking but not very mobile or flexible! Dewey - I've seen your pics before & I do like those supports - I've been considering something similar. I can see the screw holes at the bottom, but how did you anchor the rest? I presume they're set into studs? Thx. 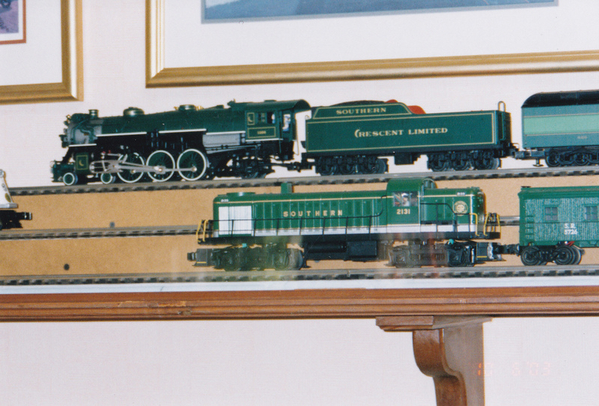 Neil- If you build the siding, make sure the spurs are long enough to fit what you intend to put up there (spare loco's, etc). Otherwise they will be a waste. Put it to the wall side so that you don't block the view of the running train. 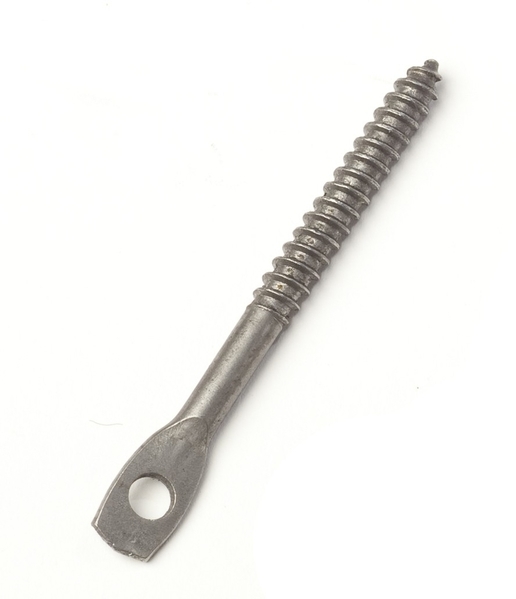 For better grip in MDF make sure you use "coarse" thread drywall screws. It really makes a difference. There are many brands to choose from. Also avoid "overdriving" the screws as that can lead to stripping out the screw hole. Essentially the screw becomes a drill bit and reams out the threads it just cut in the MDF. I would recommend SPAX star drive screws. I have used them for quite some time. Get 'em at the Depot. Bob, yes I do see what you mean! 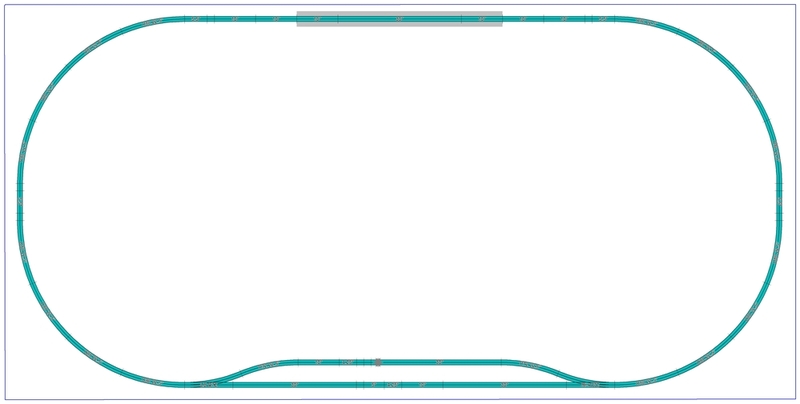 A ScaleTrax #4 can be used to make a siding off of the curve, then, with a cut ScaleTrax O80 curve to bring the mainline back to parallel you could make a nice smooth move to long siding that only requires about 8" in width. My track was all Gargraves flex due to the non-standard curves. For example O-156 on the track nearest the wall at one end of the room. 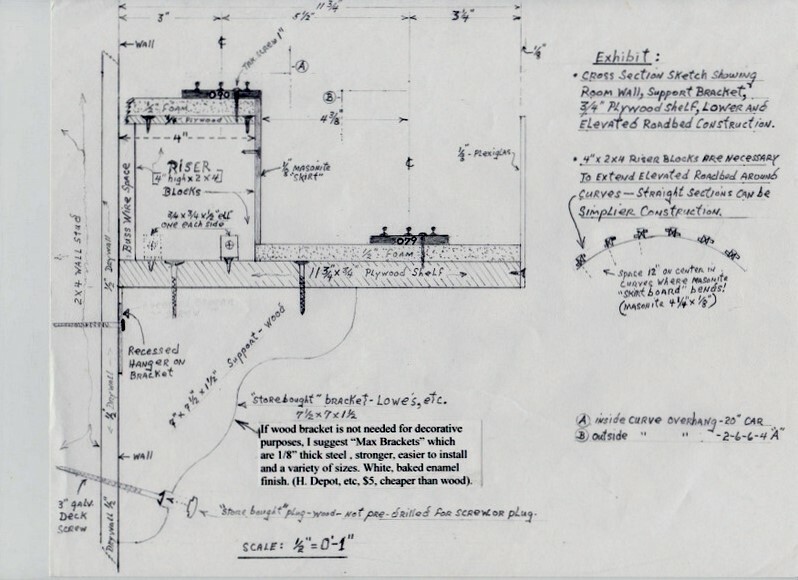 I had to bring the raised elevation of the lower shelf( 7'-6" above floor) wall track down to plywood shelf level to enable tunneling through the Domestic CEO's pantry which had only an 8' ceiling whereas the room ceiling was 20' at the ridge. Photo below shows Clinchfield Challenger with 30 hopper consist on high track of top shelf above kitchen sink. Photos were low quality due to point and shoot camera and reflection from plexiglas safety fence and skylight. I think I've tentatively decided on version 4A below. 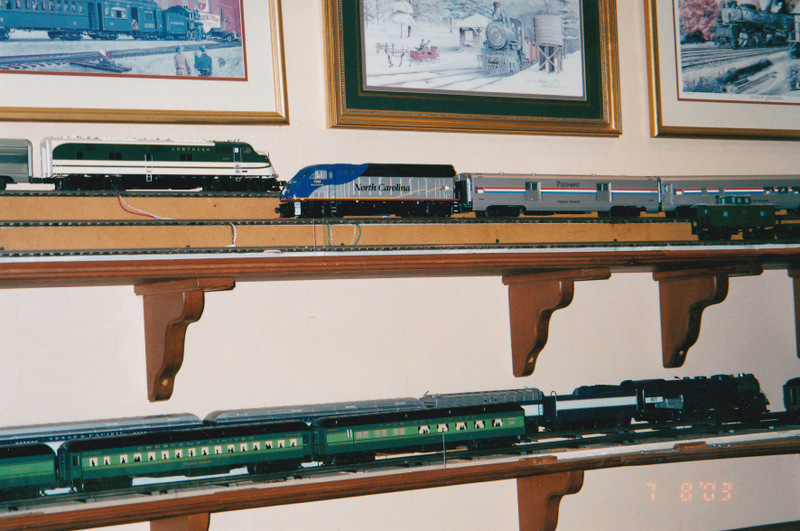 Will try to order more ScaleTrax & Flexxbed this week. Unfortunatley, my grandmother is starting to decline & was moved last week, so dad & I may not be able to synch our schedules to get this done by Halloween. Will keep you posted, though. Dewey: I've seen similar things at Lowe's/Home Depot, but they may not be wide enough for the corners. Thinking about maybe using some solid metal (~1/8: thick) L-brackets that I came across there to mount into studs & bolt shelf above. 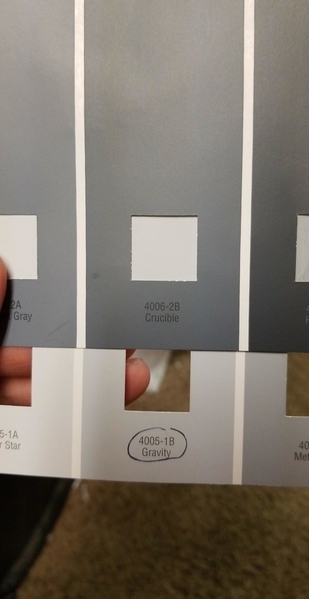 Could paint to match wall, shelf. As always, all thoughts & suggestions are greatly appreciated. I’m sorry your grandmother is declining. I’ll pray for her and your family! Thanks, Mark. BTW - I enjoy monitoring your progress on the Blackwater Canyon Line. Good luck on the expansion!